Veteran master John Varley sets many stories in a loosely connected sequence called the Eight Worlds, after humanity is evicted from Earth by superior aliens and forced to settle on other worlds. 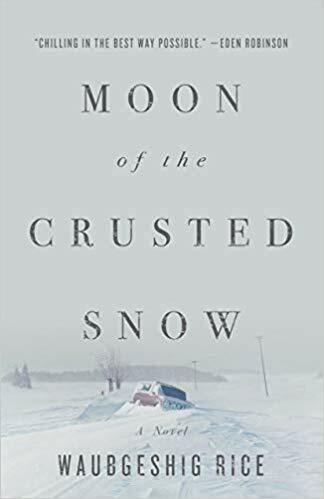 His latest is set in one of those colonies, on the Moon, but it’s also an affectionate tribute to the hard-boiled mysteries of Raymond Chandler... While the mystery deepens and gets a bit tangled, Varley’s richly imagined lunar society, a kind of theme park based on memories of Earth, is equally central to the novel, as is the wonderfully odd storytelling voice of the dog Sherlock. ... When a dame walks into former cop Chris Bach's office with a story about weaponized leprosy, something smells off. Chris and Sherlock follow her trail, which inevitably leads back to Irontown and to a past that is still very much alive. Varley gleefully mashes together elements of noir (including racial stereotypes), cyberpunk, and hard SF that jostle for space. But the conspiracy at the heart of the story barely hangs together, and Chris is too mild to be a knockoff Philip Marlowe. Readers who like talking dogs, wiseguys, dinosaur farms, and bloody battles will be entertained. Readers who don’t can consider themselves warned. 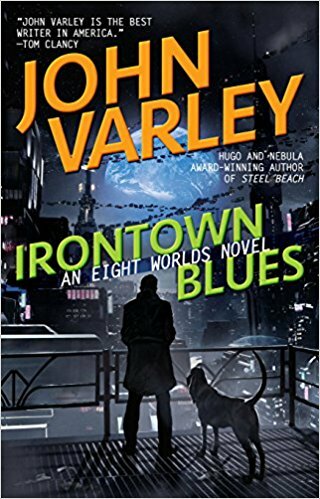 John Varley’s Irontown Blues is the third volume in a loosely connected trilogy set in one version of his Eight Worlds ... Considered as a detective novel…the problem isn’t that Bach is terrible at his job. He unravels the clues quickly enough. If he is not as careful as he should be, neither were his role models. It’s more that Smith and her compatriots have chosen a pretty baroque path to their goals for reasons that, when explained, were not as convincing to this reader as they could have been. Granting that the faction in question has already been established as a conclave of eccentrics, surely there was a better way? But at least there’s Sherlock, smarter than his owner credits and even more determined than Bach. Bach may be but a pawn in a deadly game, but his faithful dog is at least a knight. What did you think of Irontown Blues?